Walking the Camino is often a group exercise. You see the same faces over and over again on the trail, at the cafes, in the hostels. A camaraderie begins to build. But every so often the explorer finds himself/herself alone. It might be for mile or it might be for a morning. This was one of those mornings. I'll not forget it. The sky was cool and overcast, the mountains were rising, the birds were in full song, and the forest had an earthy smell. Rabbits darted across the road. Twice. These are the mornings to savor. The road leads to Cacabelos, Spain. Beyond that, the trail climbs into Galicia. Bob and I came across a large poppy field while hiking through the La Rioja region of Spain. We saw no cameras. The poppy belongs to the Papaveraceae family, a group of plants known for the production of a milky latex. Poppies are most often found in dryer corners of Europe and Asia. Australia is a notable exception. Many genera are prized for their flowers. However, one species, Papaver somniferum, has been engineered specifically for its production of latex. 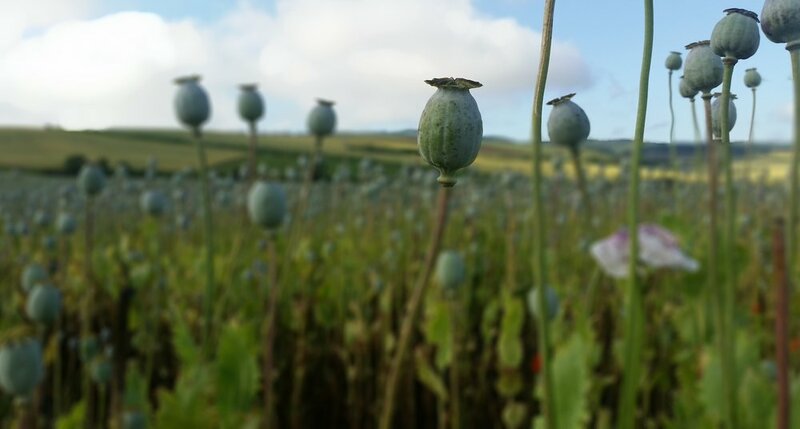 I don't know if the plants we found in this field belong to this species, but I do know that alkaloids obtained from its latex are opiate; they have deep physiological effects on humans and other animals. Seed pods are scratched, the latex drips out and dries. Collected and processed, we call this residue by names like morphine or codeine or heroin. Use of opiates in the Mediterranean basin goes back a long way. 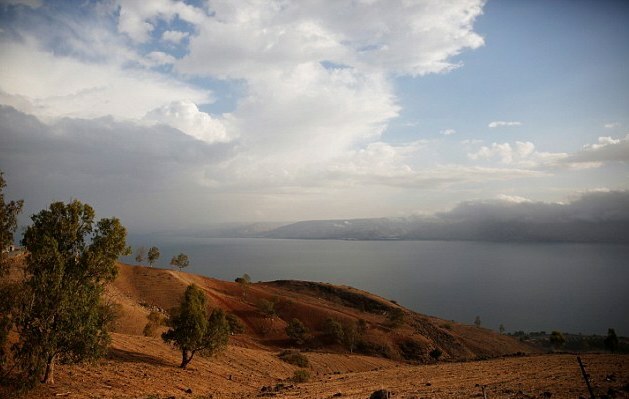 It is well-documented in the Hellenistic period, centuries before the time of Christ (see the interesting article here). Spain is the second largest producer of opiates in the world. The government keeps a close eye on the fields. See the article here for more on this Spanish industry. The portal that leads into the Church of Santiago el Mayor in Puente la Reina, Spain, is elaborately decorated. Stone columns rise on either side of the doorway. These are topped by capitals that function as arch supports. This particular capital caught me by surprise. The motif is not unique to this Romanesque church and has been described as a "column-swallower" or a "column-spewer" (depending on which way the imagination reads the architecture.). It may be related to the "foliage-spewer," another common figure. The stone "canvas" of medieval church portals seems to attract presentations of heaven and hell and those destined for each. The column-swallower may be suggestive of the evil forces that must be resisted. They eat at the church. Medieval art is just macabre. The Cathedral of Saint Mary of Burgos (La Santa Iglesia Catedral Basílica Metropolitana de Santa María) awakens at sunrise. Its spires curl skyward, sprouting one upon another. It stretches horizontally as well as vertically, expanding in all directions over the centuries. Work on the Cathedral began in the year 1221. Its lines were determined by gothic trends already established in Paris and Reims. Later styles were introduced as the structure developed over the course of the next five hundred years. Bob and I visited the Cathedral in the afternoon when it was busy with tourists. I captured this photograph on the following morning when Burgos was still asleep and the plaza was deserted. The path of the Camino Francés crosses the shadow of this World Heritage Site. If you are interested in other fantastic medieval structures, you should join Mark and Vicki for a Mediterranean cruise in October, 2018. See the link here for details. Naturally, we'll be visiting sensational sites near the water like Messina, Taormina, Valletta, and Rhodes. I plan on bringing my camera. There are more views than my mind will remember. You will lean back in your chair when the server brings out the Spanish paella! Carried directly from the fire to the table in its own special pan (paella is derived from the Latin word for pan), it comes with a warning: "Don't touch!" It is bubbly, sticky, and delicious. Ingredients in paella include rice, olive oil, and saffron. Beyond that, common gives way to the creative. Pictured here is standard paella of rice, chicken, and beans. Other cooks add seafood, rabbit, snails, artichokes . . . well, you get the picture. Paella seems to have originated in Valencia, the orange capital of the world. In that setting, the ideal paella is cooked over an open flame fueled by wood from citrus trees. Pine cones are added to the fire to produce a unique flavoring smoke. 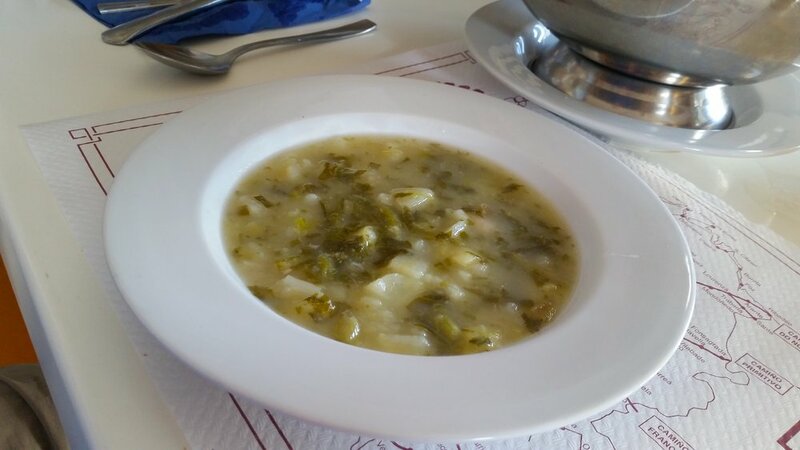 It is a regularly featured dish on the Camino Francés. Note: You will lean back in your chair when you are finished as well. I promise. I hope to exhibit some self control while dining aboard the luxury liner, the Celebrity Reflection. Care to join us? We'll be cruising the Mediterranean between October 11-22, 2018, eating great food, visiting famous port cities, and talking about "the Great Sea" in the New Testament period. See the link here for details. An optional add-on visit to Rome is possible on either end of the trip. Consider this your invitation! No words. I simply have no words. You might look at this though.